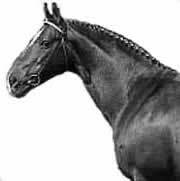 The ideal horse neck conformation is about one third the horses length, measured from the poll to the withers, with a length comparable to the length of the legs. 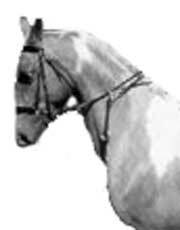 A horizontal Horse Neck Conformation is the ideal and should be sought out. The neck is set on the chest neither too high nor too low, with its weight and balance aligned with the forward movement of the horse’s body. Although relatively uncommon, it is usually seen in Thoroughbreds, American Quarter Horses and some Warmbloods. A horizontal Horse neck conformation is advantageous in every equestrian sport, as the neck is flexible and works well for balancing. The neck is not too bulky, thin, long, or short. The horse will be easy to supple, will develop strength and will accept control with hand and leg aids. The crest is convex or arched with proportional development of all muscles.This is an ideal neck conformation. Quite common and seen in all breeds and in all equestrian sports. The neck appears as if it is flowing into the back. It looks good and creates an efficient lever for manouvering. The strength of the neck with proportional development of all muscles improves the swing of the shoulder, elevates the shoulder and body, and aids the horse in engaging the hindquarters through activation of the back. 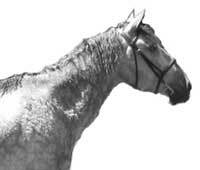 Long necks are common, especially in Thoroughbreds, Saddlebreds, and Gaited Horses. It can make it hard to balance the horse, and the horse may fatigue more quickly as a result of carrying too much weight on the front end. It is easier for the horse to fall into the bend of an S-curve than to come through the bridle, which causes the horse to fall onto the inside shoulder, and makes it difficult for the rider to straighten. A neck that is less than 1/3 the length of the horse. Short necks are common, and seen in every breed. A short neck is often quite flexible despite appearing thick and muscular, and the function and range is rarely altered. May be slightly less flexible at the poll, but the horse’s maneuverability and agility is generally not affected. It does not shorten stride length, which has more to do with shoulder slope. The horse may not excel at jumping high obstacles or galloping at high speeds, and may not be as handy at quick directional changes. The horse has an overly large crest that may fall to one side in extreme cases. Relatively uncommon, although any horse can develop an excessively large crest. 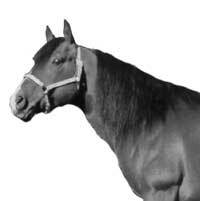 It is usually seen in stallions, ponies, Morgans, and draft breeds. It is usually from fat deposits above the nuchal ligament. An excessively large crest not only looks bad, but it puts more weight on the forehand. An obese horse with a large neck and fallen crest will need a proper conditioning program. 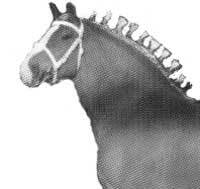 The horse has a short, thick, and beefy neck with short upper curve. The attachment to its body is beneath the half-way point down the length of shoulder. A bull neck is desirable for draft or carriage horses, to provide comfort for the neck collar. The muscles of the neck also generate pulling power. The horse is best for non-speed sports. A neck with internal structure that causes it to bend upward instead of down in the normal arch. 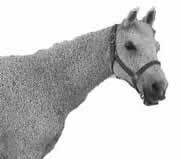 This fault is common and seen in every breed, especially in long-necked horses. The fault may be caused by a horse who holds his neck high (stargazing). Stargazing makes it difficult for rider to control the horse, who then braces on the bit and is hard-mouthed. The ewe neck is counter-productive to collection and proper transitions, as the horse only elevates the head and doesn’t engage its hind end. The horses loins and back may become sore. The sunken crest often fills if the horse is ridden correctly into bridle. The horses performance will be limited until proper muscle is developed. 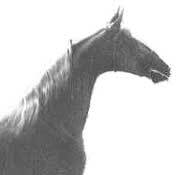 The horse has a neck set at a high upward angle, with the upper curve arched, yet a dip remains in front of the withers and the muscles bulge on underside. This conformation type is common, especially in Saddlebreds, Gaited horses, and Thoroughbreds. A swan neck makes it easy for a horse to lean on the bit and curl behind without lifting its back. 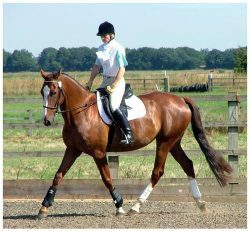 The horse is best used for showing, dressage, jumping, and harness work. A long, skinny neck, with poor muscular development on both the top and bottom. Appearance of a straight crest without much substance below. A knife-neck is relatively uncommon, although any breed can be affected. It is usually associated with poor development of back, neck, abdominal and haunch muscles, allowing the horse to go in a strung-out frame with no collection and on the forehand. It is often rider-induced, and usually indicates lack of athletic ability. The knife necked horse is best for light pleasure riding until its strength is developed.